Although historically my sewing tapers off after summer, I've decided this year to participate in Colette Patterns Fall Palette Challenge. The goal - make a unified palette of items within 8 weeks! I'm going to be overly ambitious here with my challenge projects, but here we go! For the challenge, I'm using all fabrics from my stash. 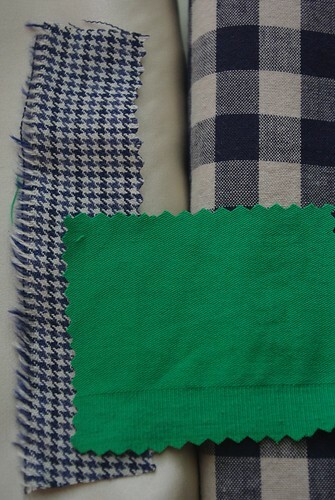 They are (clockwise from top left corner): super pale peach silk charmeuse from Denver Fabrics, large check gingham shirting (source unknown), green stretch twill from Denver Fabrics, and blue/black wool houndstooth from Fabric Row in Philly. My first project up will be New Look 6909,View C. I saw this dress in a display at JoAnn's and knew I had to make it. 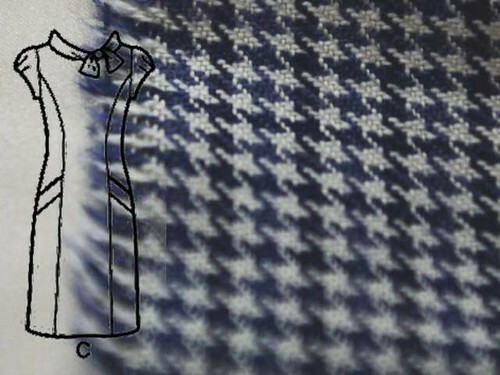 The fabric will work perfectly, as it's both warm and work appropriate! Second up, Clover from Colette Patterns in the green twill. 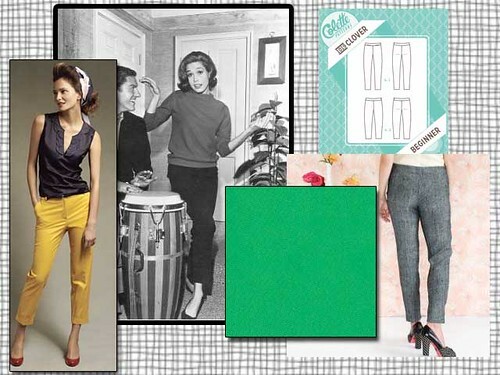 I was so excited to see Colette do a pants pattern, especially since pedal pushers/clamdiggers/capris have been on my to-sew list for ages. If I have time, I'd love to do a pair in black as well. 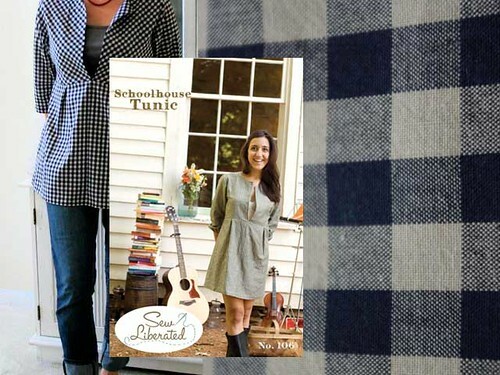 Thirdly, Sew Liberated's School House tunic in the gingham. This is a pattern that's been on my wish-list for ages and I think the fabric will be a great fit. I'm leaning toward the shirt length version. If I have time (and I assuredly won't) I'm aiming to use the silk charmeuse for a Cinnamon Slip. So there's my pieces for the Fall Palette Challenge. I'll keep ya'll updated as I go along, and let me know if you're playing too!